When I scroll through listings and come across a headline similar “Best on the Market,” I normally laugh quietly to myself at the seller’s desperation for attention. I then investigate to find a standard example with a corroded movement that has been polished to hell. 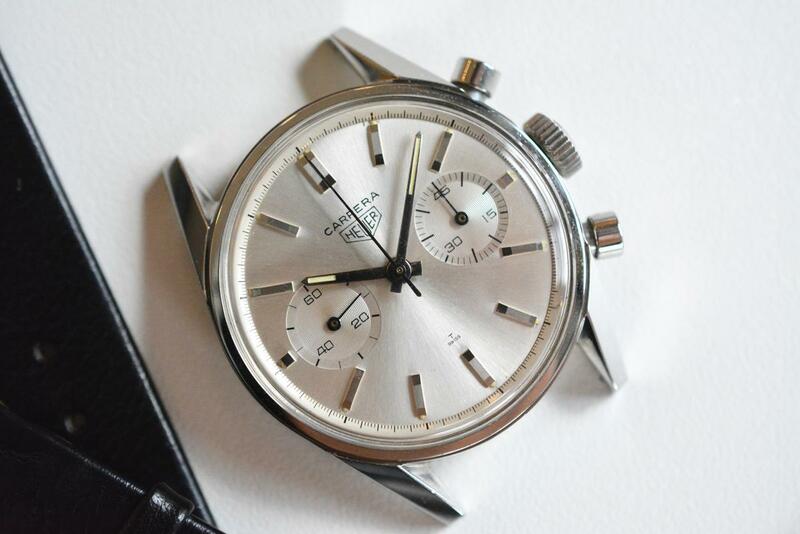 When this Heuer Carrera 3647 was posted this morning, I ate my jaded cynicism for breakfast. The 1960s Carrera is a model that needs no introduction, the swan song to Jack Heuer himself. The reference was worn by Mcqueen, multiple racing teams, and been re-issued by the new Tag Heuer multiple times since its inception. This is the original. A first execution with a clean two-sub chronograph layout, bright diamond-polished case, and manually winding Valjoux 92. Simple purposeful design does not age. These first generations came in a variety of finishes. The white dial, lumed straight hands, and applied indices make this particular 3647S aesthetic a monument. If you can stand to go without documentation, this is the best deal I’ve seen this year. There’s this somewhat snobbish attitude that has plagued Heuer’s vintage market in the last few years. I’d like to brief address it. Heuer has come under attention from major media outlets (thanks Jeff) only recently. Rolex collectors tend to say things like “I just don’t see the value.” Well, I do. Just because a house has been underappreciated historically doesn’t mean it isn’t hugely valuable. The example here today is stunning. The edges are sharp and clearly unpolished. The original tritium is perfect, including above the indices. Letter and subs of the radially brushed dial haven’t aged a day. I’d like to see a movement picture, but I’m willing to be it’s as lovely as the exterior. Let’s hope anyway. I choose to feature this Carrera not just for its condition, but its condition and value. Ace photography as well. It’s a bit of a steal. I won’t hear otherwise and doubt it will sit around long. Find it here on Chronocentric for 5850 EUR.